[Thomas Denman [Lord Denman], judge and Lord Chief Justice.] Autograph Signature ('Denman') to frank addressed by him to Rev. William Plucknett of Alresford. On one side of 7.5 x 12 cm panel cut from front of envelope. In fair condition, lightly aged, with thin strip of paper from mount adhering to blank reverse. Frank laid out in the prescribed fashion, with the red postal stamp ('FREE | 28AP28 | 1835'). Denman's signature ('Denman') is at bottom left, and he addresses as follows: 'London Apl twentyeight | 1835 | The Rev W Plucknett | Wincanton | Alresford | Somerset', with the last three lines deleted by Denman and replaced by 'Alresford | Hampshire. [Lord Birkett, judge who officiated at the Nuremberg Trials.] Two Typed Letters Signed (both 'Norman Birkett') to 'Mr Burnett', i.e. Hugh Burnett, producer of BBC TV series 'Face to Face', regarding arrangements for his interview by John Freeman. On letterhead of the Royal Courts of Justice, Strand, London, W.C.2. 25 May and 9 July 1953. 'Face to Face', consisting of interviews of notable figures by John Freeman, was a television milestone, and Birkett's was the first interview in the series, broadcast on 4 February 1959. As Burnett recalled in his book of the series: 'Lord Birkett was the first guest on FACE TO FACE. It was a live transmission, as were most FACE TO FACE broadcasts, and much of the character and success of the whole new series depended on his candour and co-operation. We plotted together as we had often done in the past. He enjoyed broadcasting and he liked the challenge of attempting something new. [ John Campbell, 1st Baron Campbell, Lord Chancellor, as Attorney-General. ] Autograph Letter Signed (J. Campbell'), concerning the 'Seminary Cadetship' of Robert Campbell at the East India Company Military Seminary at Addiscombe. New Street, Spring Gardens [ London ]. 9 December 1834. 3pp., 12mo. Bifolium. In good condition, on lightly-aged paper. The recipient is unnamed. The letter begins: 'Sir | The President of the Board of Control has been pleased to present me with a Seminary Cadetship for Mr Robt. Campbell a youth of 16, son of John Campbell Esq of Kilberry in the County of Argyle. [ Sir Robert Phillimore, last judge of the Court of the Lord High Admiral of England. ] Autograph Note Signed ('Robert Phillimore') to 'Mr Hammond' (his clerk? ), with directions regarding a copy of a letter. On letterhead of 5 Arlington Street, London, S.W. 21 March [ no year ]. [ Sir John Gurney, judge, to Sir Frederick Pollock. ] Autograph Letter Signed ('J Gurney') to 'My dear Pollock' (Sir Frederick Pollock), regarding his having to 'half try' a case at Lancaster, and the purchase of manuscripts for the Temple Library. 'L. I. F', i.e. Lincoln's Inn Fields, London. 10 April 1833. 2pp., 12mo. Bifolium. In good condition, lightly aged, with part of the blank second leaf cut away. Addressed to 'Myy dear Pollock'. Headed, presumably by Pollock, 'a note from Baron Gurney'. The letter begins: 'I have not yet discovered how it is that I am here instead of being at Lancaster where I expected to be at this time summing up. [ W. Howland Roberts, Honorary Secretary, The Society of Judges of County Courts. ] Proceedings of the General Meetings of the Society, held respectively on Friday, the 5th of May, 1905, and Friday, the 3rd of November, 1905. 12pp., 12mo. Stapled pamphlet. On aged paper, with rusted staples. The first report is on pp.2-4, the second on pp.5-8, signed in type (p.8) by Roberts; pp.9-11 carry the 'Report of the Committee', signed in type (p.11) by Roberts and dated 3 November 1905; p.12 carries financial accounts by Roberts for the year 1905. A point of discussion is 'the Bill relating to County Courts, now before Parliament'. From the papers of Sir Richard Harington of Ridlington, 11th Baronet, who is listed among those present at the first meeting, at the beginning of which he made a couple of contributions. [ Bengal Chamber of Commerce, Calcutta. ] Printed letter from 'W. Parsons, Secretary' to the Secretary of the Government of India, Home Department, 'on matters connected with the High Court of Judicature at Fort William, in Bengal'. 4pp., 8vo. Bifolium. In good condition, lightly aged. With compliments stamp. Signed in type at end by Parsons. Divided into seven sections, and beginning: 'On more than one occasion, in recent years, the Committee of the Bengal Chamber of Commerce have ventured to address the Government of India on matters connected with the High Court of Judicature at Fort William, in Bengal, and their representations have always been favourably received. [ Victorian assizes on the Oxford Circuit, 1891-1899. ] Nine printed Calendars of Prisoners, for trial at seven Assizes and three Quarter Sessions, at Gloucester, Hereford, Stafford and Worcester. With annotations by the future Sir Richard Harington. Between 1891 and 1899. One Gloucester catalogue by John Bellows; one Hereford catalogue by S. Adams; two Stafford catalogues by Wright & Roberts; five Worcester catalogues by Deighton and Co.
Nine 4to calendars of prisoners at six assizes and three quarter sessions at the following locations on the Oxford Circuit between 1891 and 1899: Gloucester (1), Hereford (1), Stafford (2), Worcester (5). Each of the nine is stapled and unbound. ONE: County of Hereford, Autumn Assizes, December 1891, pp. TWO: County of Worcester and City of Worcester, and County of the same City, Winter Assizes, February 1895,  + 9pp. THREE: County of Stafford, Winter Assizes, March 1895,  + 13pp. FOUR: County of Stafford, Autumn Assizes, November 1895,  + 21pp. [ Sir Richard Harington, judge. ] Autograph five-page 'Suggestion', being the evidence he proposes to give, as Vice-President of the Society of Chairmen of Quarter Sessions, to the Royal Commission on the Selection of Justices of the Peace. Harington's document undated, on reverse of letterhead of the Shire Hall, Hereford. With TLS from the Society of Chairmen and Deputy-Chairmen of Quarter Sessions in England and Wales, Guildhall, Westminster, dated 21 April 1910. In fair condition, on lightly-aged and rolled paper, attached with a rusty safety-pin. ONE: Harington's 'Suggestion'. 5pp., 4to. The document begins with his CV as it relates to England, the last entry in which reads: 'Chairman of Herefordshire Quarter Sessions since October 18, 1880. V[ice]. P[resident]. of Society of Chairmen of Q[uarter] S[essions]. [ Lord Hatherley, Lord Chancellor of England. ] Autograph Document Signed ('Hatherley C') regarding closure of circuit court of Richard Harington, in franked envelope. With signed document ('Hatherley C'), appointing Harington to another circuit. Document regarding closure of circuit court: 19 March 1872. Place not stated, but in envelope with London official frank. Appointment document: 28 August 1872. ONE: 1p., 4to. Embossed with government seal at head. In good condition, lightly aged. Reads: 'I The Right Honourable William Page Baron Hatherley, Lord High Chancellor of Great Britain, do hereby sanction the closing of the County Courts of the Circuit No. 34 during four weeks in the month of August next, Richard Harington Esqre., The Judge of the Same Courts, being desirous of holding Courts in the month of September next. | Hatherley C'. In envelope with Hatherley's signature ('Hatherley') at bottom-left of front, addressed in autograph to 'Richard Harington Esq | Heath Lodge | Hanwell'. [ Sir John Simon, Lord Chancellor. ] Three Autograph Letters Signed, two Typed Letters Signed (variously 'John Simon' and 'J. A. Simon'), and one Autograph Note Signed ('J. A. Simon') to Sir Robert Ernest Dummett, on legal and political matters. Two on letterheads of the Solicitor General, two from 57 Kensington Court, London, one from 4 Brick Court, Temple, one from All Souls College, Oxford. Between 1900 and 1912. The collection in good condition, lightly aged and worn. ONE: ANS ('J. A. Simon'). 17 January 1908. 1p., 12mo. From 4 Brick Court, Temple. Giving notice that he is that day 'applying to the Lord Chancellor for silk'. Accompanied by an undated Autograph Memorandum by Frederick Allan Wilshire (1868-1944), Recorder of Bridgwater, stating that it is 'of particular interest. When a Barrister applies for silk he has to write a similar letter to this to all members of the circuit who are his senior. | Simon recommended me to the King for the Recordership of Bridgwater. | F. A. W.' TWO: ALS ('J. A. On his monogrammed letterhead. 19 May 1873. 2pp., 12mo. In good condition, lightly aged. He was 'much pleased' with his son's 'performance last Saturday', which he considers was entirely due to Heymann's 'excellent tuition', and he is adding an amount to the sum Heymann has charged. [ Albie Sachs, South African activist. ] Typescript of his book 'Soft Vengeance of a Freedom Fighter', with variations from the published version. Without date or place, but between 1988, when the events described occurred in South Africa, and the publication of the book in 1990. 113pp., 8vo. On 57 leaves, stapled together, with white card backing. No title-page. Worn and aged, with first leaf detached, but in fair condition overall. In 1988, in Maputo, Mozambique, where Sachs was exiled as an ANC activist, he lost an arm and his sight in one eye when a bomb was placed in his car by agents acting for the South African Regime. Sach's memoir is an important document in the history of the South African freedom struggle. Widely praised on its publication, it received the Alan Paton Award in 1991. [ Henry Petty-Fitzmaurice, 3rd Marquess of Lansdowne. ] Secretarial Letter, signed 'Lansdowne | &ct. &ct.', to 'Sec[retar]y. of Commission', containing a list of 'the names of [Wiltshire] Gentlemen to be added to the Magistracy'. Bowood [ Bowood House, Derry Hill, Wiltshire ]. 20 December 1861. 3pp., 4to. Bifolium. In good condition, on aged and lightly-worn paper, with a few minor rust stains. Addressed on reverse of second leaf to the Secretary of the Commission of the Peace. In the hand of a secretary, and signed by Lansdowne. Addressed by Lansdowne on reverse of second leaf 'Sec[retar]y. of Commission'. Docketed: 'Decber. 20th 1861 | Wilts | Ld. Lansdowne recd several | <?> all but the 2 parsons'. [ Sir Joseph Jekyll, English judge. ] Autograph Signature ('J Jekyll') from frank. On irregular piece of paper (4.5 cm wide, and up to 2.5 cm high). In good condition, lightly aged. Good firm hand. Reads 'Free | J Jekyll'. 34 Rutland Square, Dublin. 9 May 1870. 2pp., 12mo. On leaf with mourning border. In good condition, lightly-aged, with neat repair to a short closed tear. He is returning a memorandum, 'which is quite correct & may be acted on', and has made a payment of £380 to his account with Drummonds Bank. [John Leslie Foster, Irish judge.] Autograph Letter Signed ('J Leslie Foster') to 'W. Wallich', thanking him for his attention to a request. Rathescar, Dunleer [Ireland]. 19 January 1830. 2pp., 4to. Bifolium. Docketed on reverse of second leaf. In fair condition, on lightly aged and worn paper, with one dog-eared corner. He has received Wallich's letter, and thanks him for his 'great kindness in attending so effectively to my request'. Docketed in a small contemporary hand at head of first page. [John Inglis, Lord Glencorse.] 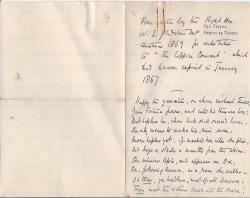 Autograph Letter Signed to him from his 'affectionate Cousin | J Taylor'. Tibbermore [near Perth, Scotland]. 16 December . 4pp., 4to. Bifolium, with the last page of text cross-written over the first, and the valediction and signature cross-written over the second. In fair condition, on aged paper, with short closed tears along crease lines of the second page. Addressed on reverse of second leaf, with red wax seal and postmarks, to 'John Inglis Esq | Balliol College | Oxford', and redirected to 'Loganbank'. [Thomas Denman, 1st Baron Denman, English judge.] Autograph Note Signed ('Tho Denman') giving instructions to his wine merchants. 50 Russell Square, London. 17 March 1831. 1p., 12mo. Good, on aged paper, with traces of grey paper mount adhering to the reverse. Reads: 'Gentlemen | I shall be much obliged by your forwarding the wine to me immediately with an account of your expences - | Your obedt servt | Tho Denman | 50 Russell Square | March 17. 1831'. [Printed pamphlet.] Federation of Malaya. The Evidence Ordinance of the Federation of Malaya. F. of M. No. 11 of 1950. With Index. Compiled by S. Kula Singam, M.B.E., First Legal Assistant, Attorney-General's Chambers, Kuala Lumpur. Kuala Lumpur: Printed at the Government Press by H. T. Ross, Government Printer. 1951. + vii + 84pp., 8vo. In grey printed wraps. Very good, with rusting from staples. Singam's 'subject-matter Index' covers pp.63-84. Scarce: the only copies on OCLC WorldCat and COPAC at the British Library, Lousiana State University Law Library, and Singapore. From the private papers of C. A. A. Nicol (1921-2012), OBE, CPM, AMN, who was a 'Member of a joint FCO/MOD department in Hong Kong' between 1970 and 1975. Autograph Letter Signed ('FitzRoy Kelly') from Sir FitzRoy Edward Kelly to J. T. Barry, declining to join his 'excellent association' [the Metropolitan Association?] on the grounds that it is incompatible with 'the office which I now hold'. New Street. 9 August 1845. 3pp., 12mo. Bifolium. Fair, on lightly-aged paper. It is not 'from inattention or indifference' that Kelly has left Barry's letter unanswered. 'I think it would be inconsistent with my duty in the office which I now hold to become a member of your very excellent association'. Autograph Signature ('T N Talfourd') of Sir Thomas Noon Talfourd, English judge, Member of Parliament for Reading in Berkshire, and promoter of copyright reform; as part of frank. Shrewsbury. 23 March [circa 1829]. On 7 x 11 cm rectangle cut from front of envelope. In fair condition, on lightly-aged paper, with glue from mount adhering to reverse, which is docketed in pencil: 'Serjt Talfourd | Readng | Berks'. The frank reads, with the words in square brackets not in Talfourd's hand, unlike the rest: '[Shrewsbury March] Twenty three | [The Very Revd.] The Dean | Hereford | [signed] T N Talfourd'. Autograph Letter Signed ('Tho Wilde') from the Solicitor General Sir Thomas Wilde to an unnamed individual, on 'The Lithgon Case'. Dover Street; 9 January . 3pp., 12mo. Fair, on aged and worn paper. 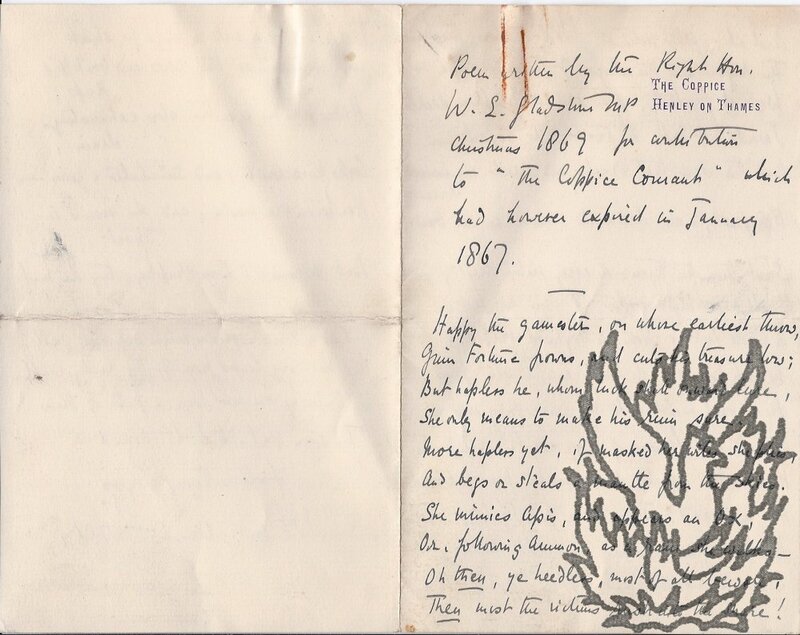 Wilde explains that he had previously written regarding the case, but 'by some accident the Letter has been mislaid (I believe) among my mass of papers, and I therefore fear it may not have reached you as I cannot learn who among the Servants dispatched it'. Manuscript transcription by Lord Phillimore, of a 'Poem written by the Right Hon. W. E. Gladstone MP Christmas 1869 for contribution to "The Coppice Courant" which had however expired in January 1867.' With typescript. Transcription undated, on Phillimore's letterhead of The Coppice, Henley on Thames. Typescript undated. Phillimore's transcript: 12mo, 3 pp. On bifolium. Text clear and complete. Fair, on lightly-aged paper, with mark from rusted paperclip at head. Thirty-six line poem, in heroic couplets, with 'W E G. Christmas 1869' at end. Typescript (folio, 2 pp), with a couple of manuscript corrections. Fair, on aged paper. Typescript (folio, 2 pp), with a couple of manuscript corrections. Fair, on aged paper, with light marks from a paperclip at head. Thirty-six line poem, in heroic couplets, with 'W E G. Christmas 1869' at end, beginning 'Happy the gamester, on whose earliest throw, | Grim Fortune frowns, and cuts his treasure low; | But hapless he, whom luck shall onward lure, | She only means to make his ruin sure.' Made for Sir Robert Joseph Phillimore, of the Courant, Henley on Thames, judge, Liberal MP and lifelong friend of Gladstone's. 16mo, 20 pp. Stitched. In original blue printed wraps. 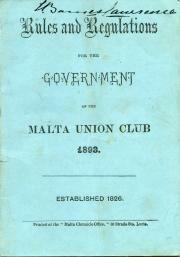 Fair, on lightly-aged paper, with the pamphlet folded once. The Club's 25 rules are preceded by a list of the Committee of Management. Ownership inscription of L. Barnes-Lawrence at head of front wrap, but annotated and amended throughout in Gatty's hand. From the residue of Sir Stephen H. Gatty's papers. 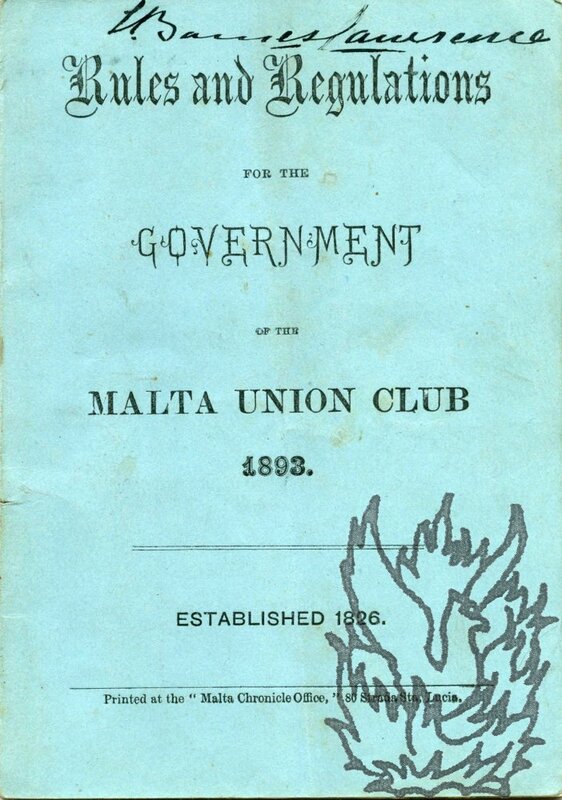 A scarce piece of Malta ephemera: no copies at the British Library or listed on COPAC (although the latter does carry a record for a 1903 edition). Autograph Letter Signed to [George Kenneth] Menzies[, Secretary, Royal Society of Arts]. 22 January 1918, on letterhead 'DEAN PARK HOUSE | EDINBURGH'. Scottish judge (1857-1942). One page, 12mo. Black-bordered. In good condition. Thanks Menzies for the copies of the Society's journal. 'I have ceased to have any active connection with the Copper Company, but I found Professor Carpenter's Lecture very interesting, although it is pretty technical - | I hope you and your wife are keeping well'. Signed 'Edw T Salvesen'.